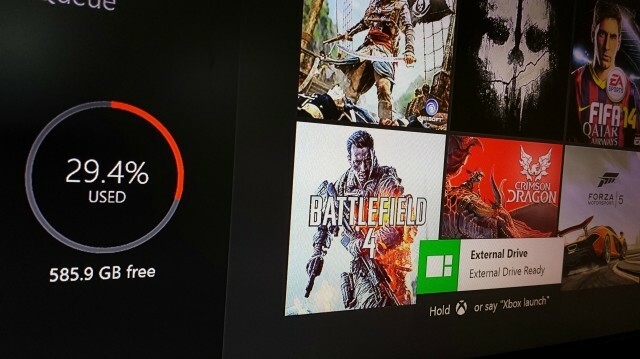 Microsoft has revealed that they might consider adding support for external hard drives to the Xbox One console and just as this news gets out, an Xbox One developer has posted a photo on Reddit which clearly shows an external HDD functioning with the Xbox One. The new announcement comes after Microsoft has revealed that they are going to release a $399 Xbox One console without the Kinect peripheral. For the external HDD Support, Microsoft hasn’t provided an exact date when it will be available but according to the developer, it would be up pretty soon. If Microsoft can manage this, they will surely attract more sales as this is one of the features everyone was looking upto. More updates might be revealed in the upcoming E3 event, till then fingers crossed to see this happening!